Are you self-conscious about opening your mouth in front of others because of your stained teeth? Coffee, tea, curries, red wine and even the natural aging process can leave your teeth discoloured and dull, but luckily, this is one of the easiest cosmetic dental problems to correct. All it takes is a professional teeth whitening treatment administered by your Toorak cosmetic dentist at Simply Smiles Dental. You may have already tried over-the-counter whitening toothpastes, rinses and strips and found yourself disappointed with the results. These products can take weeks or months to show any whitening effects, and even then, your teeth may only be a few shades lighter. This is because these products contain very low levels of hydrogen peroxide or carbamide peroxide. If you want true results that last, you must see your dentist Melbourne to obtain treatments containing professional-grade bleaching formulas. For fast, dramatic whitening results, you may choose to undergo Zoom! whitening in our office. We will apply the professional-strength hydrogen peroxide gel to your teeth and shine the special Zoom! light on them for 15 minutes. We’ll repeat this process three more times. In just under an hour, the whitening formula will remove stains in the tooth enamel and underlying dentin layer of the tooth, giving you a smile that is about eight shades whiter. Your dentist Melbourne will also send you home with a free touch-up kit so that you can maintain the results of your brilliant smile. If you’d prefer to perform teeth whitening at home, we also offer effective tray-based whiteners for only $298. The difference between our take-home whitening treatments and the ones you’d purchase from your local chemist is that we create custom trays to fit your mouth perfectly and provide you with a stronger bleaching formula to place in your trays. Depending on the system you choose, you’ll wear your trays either for a couple of short sessions during the day or overnight. With proper use, you can expect to see optimal results in about two weeks. To learn more about your options for achieving a brighter, whiter smile, schedule your Toorak teeth whitening appointment today. Safe, effective, and lasting teeth whitening systems start at $298. 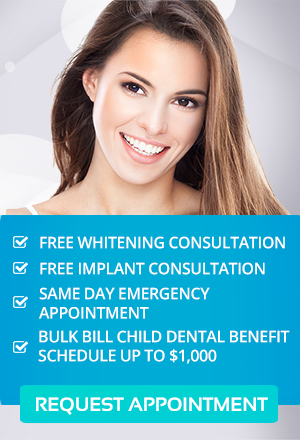 1-hour ZOOM teeth whitening procedure available at $498. We serve patients from South Yarra, Toorak Windsor, Albert Park and all Melbourne metropolitan areas.